Well, we certainly have not had a Toasty Tuesday in a while, but I guess today is your lucky Tuesday!! (uhhh, cause we are having toast). So I knew that we have been having an unusually warm and very early Spring for Seattle. But I have been so busy enjoying the warmer weather that I failed to realize what an impact it has had on our environment. I noticed that many of my favorite Spring and early Summer blooms came weeks early. But last week I spoke with the produce manager at our local grocery store and found out that the Eastern Washington stone fruit crops were a MONTH early!!! That is crazy global warming you guys. I love that they are roasted with savory thyme and they get a kick from the balsamic glaze. This is truly a beautiful and delicious recipe, one you should try soon! Preheat the oven to 400 degrees. Place the slices of baguette on a sheet pan and toast the slices of baguette for 7 minutes on the lower rack. 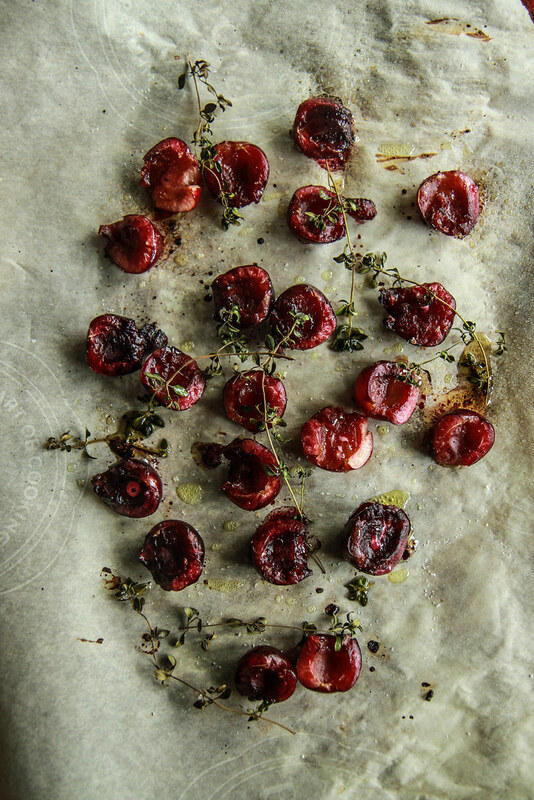 At the same time, on a sheet pan lined with parchment, place the cherries and thyme and drizzle with the 1 tablespoon of olive oil. Sprinkle the cherries with salt. Roast for 5-7 on the high rack in the oven minutes until tender and bubbly. 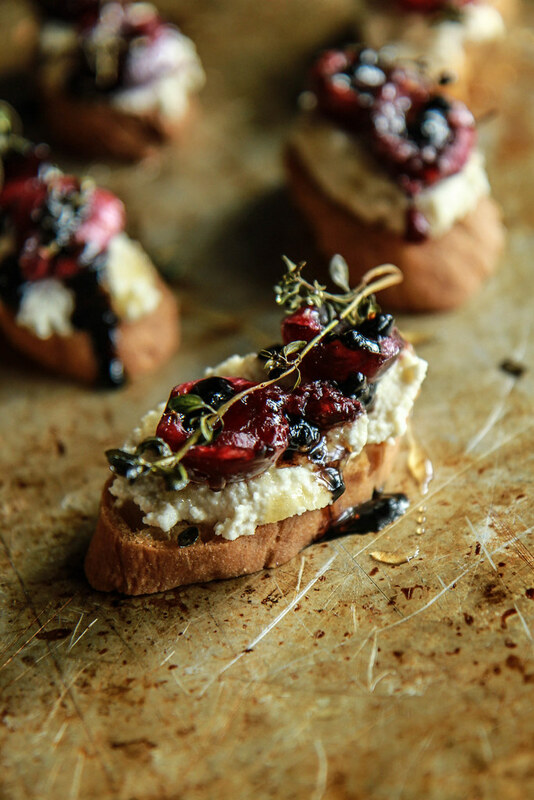 Spread a spoonful of almond ricotta onto the top of each crostini. Top with 2 cherry halves and a crispy sprig of thyme. 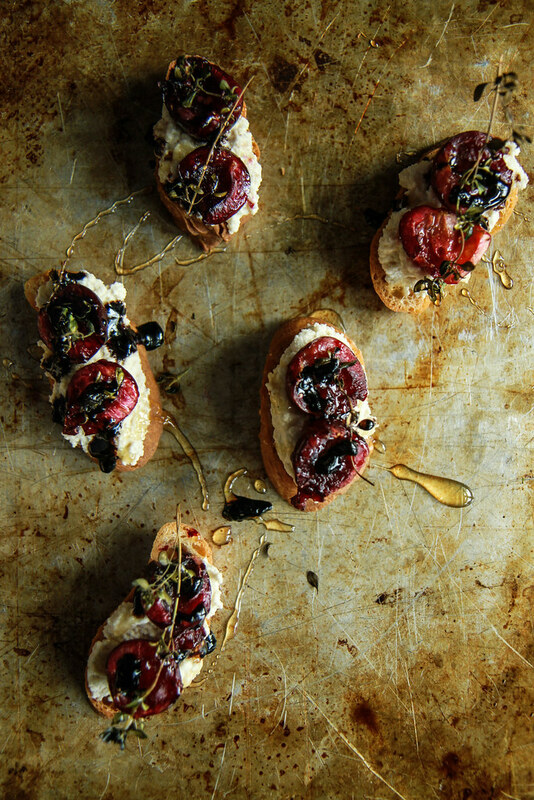 Drizzle the crostini with honey and a bit of balsamic glaze. Top each toast with a tiny sprinkle of kosher salt and serve immediately. Simply gorgeous, such nice rustic bites to enjoy perfect for a summer morning! Yesss! Cherries are everything and these are beautiful! Sorry for confusion Helen- I use agave when I make it for Vegans. Do you make the almond ricotta or can you buy it? I make it and have a post on it http://heatherchristo.com/2016/03/29/how-to-make-almond-ricotta/ or I buy Kite Hill brand at Whole Foods! Do you have a recipe you love for a baguette that is gf, df, and yeast free? i unfortunately suffer from a array of allergies. i am Celiac, i have a severe casein allergy and am allergic to yeast and cane sugar. Totally understand! We have everything but the yeast. So I don’t, but am working on one currently. We are in Seattle and buy Olivia Brand baguette- but it does have a small amount of cane sugar in theirs. How do you make almond ricotta? I am planning to make this amazing looking recipe and wanted to know which of your almond ricotta recipes did you use; the easy or the hard(er) version? Hi Katie! I made the soft Almond ricotta! This looks yummy! But can this be done with regular ricotta? For sure Diana! I just make it with Almonds because of allergies! Would I have to sweeten it somehow? Thank u for ur reply! Hi Diana- there is just the honey to sweeten 🙂 The cherries are pretty sweet on there own!